Secrets. Lies. Guilt. A shocking crime. A dark confession. Did My Sister Lives on the Mantelpiece sucker-punch your gut? Get ready for more punishment. What’s worse than doing something utterly evil? Doing it and getting away with it. Fifteen-year-old Zoe has a terrible secret that she can never confess. Until she hears of a killer locked up on Death Row in Texas. Like Zoe, Stuart is no stranger to secrets. Or lies. Or murder. So, armed with a pen and a jam sandwich, Zoe takes a deep breath and tells all… Full of heartache and dark humour, this tale of blood and betrayal is told in Zoe’s letters to a stranger. 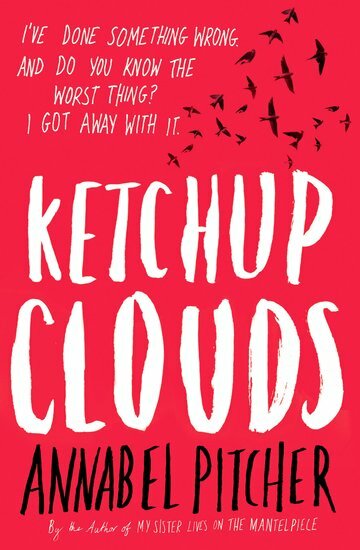 I’ve just finished reading Ketchup Clouds and it was amazing! I completely fell in love with the characters, the way the book was written and of course the story line. I really enjoyed the difference between the characters because it gave the book a lot of emotion and excitement and it helped me to get even more into the book. Due to it being the main character writing from her point of view, you’re really able to grow with the story and feel as though you’re a part of it. If you like romantic yet mysterious books which will probably bring you to tears but make you laugh then this book is definitely for you, and if not then it’s something new to try! I really hope other people can enjoy Ketchup Clouds as much as I did.